Either he knows that Wolff has him on tape or it’s the case that Bannon was simply too crucial to Wolff’s own reporting in the book for him to plausibly deny saying what he said. Michael Brendan Dougherty notes that the excerpt from the book that blew up online today is conspicuously flattering to Bannon, which wouldn’t be the first time Wolff has been complimentary of him in print. It may be that not only has Bannon been leaking to Wolff for months/years but that he’s a prime source for all sorts of details in the book. If he turns around now and calls Wolff a liar, Wolff might burn him by revealing all the anonymously sourced material that came from him or his allies. And -- ta da! -- it looks like there are tapes, after all. This mess reminds me of another time Trump got burned by an underling's decision to allow access to a reporter who ended up writing a stinging account. That flunky was unceremoniously fired for embarrassing his boss. Well, Bannon's already gone, of course, but Team Trump keeps dropping bomb after bomb on him, including a 'cease and desist' letter, citing a non-disclosure agreement. Even if you remove all of Bannon's juicy quotes, Trump would see this episode as a catastrophic error in judgment and a betrayal -- and confirmation that Bannon was a serial leaker, a grave offense in a White House paralyzed by leaks. Former White House chief strategist Steve Bannon said he's certain that Donald Trump Jr. brought attendees of the June 2016 Trump Tower meeting to meet his father. "The chance that Don Jr. did not walk these Jumos up to his father's office of the 26th floor is zero," Bannon told author Michael Wolff. Bannon's comments appear in Wolff's "Fire and Fury: Inside the Trump White House," which is based on more than 200 interviews with the president and members of his staff...Bannon is also quoted in the book saying the meeting was "treasonous" and "unpatriotic." Attendees of the meeting included Russian lawyer Natalia Veselnitskaya and other Russians. Trump was reportedly in Trump Tower on June 9, the day of the meeting. Bannon joined the Trump campaign team two months after the meeting. I'm not sure how much a West Wing cell phone ban is supposed to help comms discipline when the recent, problematic "leaks" came in over 200 interviews with an author the president encouraged staff to cooperate with. 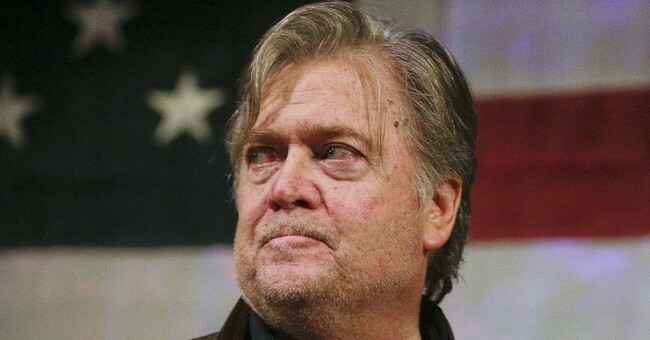 Oh, and is Steve Bannon plotting to...run for president?